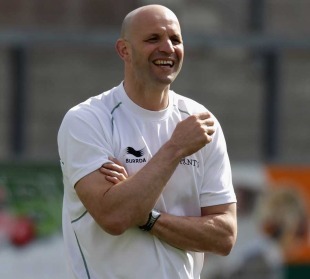 Northampton Saints' Jim Mallinder is the early favourite to replace Martin Johnson as England boss but there are a heavy overseas contingent also among the bookmakers' front-runners for the post. Former England full-back Mallinder is a 5/2 shot with William Hill, but ex-South Africa and Italy coach Nick Mallett is close behind, while Jake White, Graham Henry and Eddie Jones also feature prominently. Yorkshireman Mallinder, 45, led Northampton back into the Premiership during his first season at the helm in 2007/08, and under his guidance Saints went on to win the European Challenge Cup, Anglo-Welsh Cup and reach last season's Heineken Cup final. He has also enjoyed success at representative level, steering England Under-21s to Six Nations title success in 2006 before claiming 15 wins out of 16 games as England Saxons supremo. Former England scrum-half Dewi Morris, though, believes the Rugby Football Union should turn to Mallett as Johnson's successor. "If I was choosing it would be someone who had the experience of Mallett," Morris told Sky Sport News. "He is someone of great stature who can actually knock a few heads together, which I think needs to be done." As for Johnson's exit, Morris added: "I think he has done the honourable thing and is probably sick to the back teeth about what has been going on. "Unfortunately, he has come up a little bit short as a manager. Some of his selections have been a bit clueless and England's performance over the World Cup has not been good enough. It is time someone else took over. I remember saying three years ago that no other country in the world would have put Martin Johnson in the job as he had no experience whatsoever. "Hopefully, it is now a clean slate and they (the RFU) need to get the right person in to sort it out on the playing side." Stuart Barnes, meanwhile, believes the RFU should do everything in their power to lure New Zealand's World Cup-winning supremo Henry, who has now stepped down from All Blacks duty. Henry will be in London next week, coaching the Barbarians ahead of their November 26 appointment with Australia at Twickenham. "I would love to see Graham Henry take over," former England fly-half Barnes told Sky Sports News. "Henry is the best and most experienced coach in the world, and what he does best is that he is outstanding at developing his coaches. "Graham Henry is my choice. It would take a lot for him to leave his beloved New Zealand, but it's not out of the question." Ex-England captain Will Carling paid tribute to Johnson, stating on Twitter: "The man was an awesome player, incredible captain. One of THE greatest England players/ servants. Hope there is a role for him." And Sir Ian McGeechan, who appointed Johnson as Lions captain for the successful South Africa tour 14 years ago, said: "I was disappointed when I heard the news. For me, Martin was the right person to be heading up England. I think it will be a miss." And reflecting on Johnson's departure press conference at Twickenham, his fellow England World Cup winner Richard Hill said on Twitter: "As from start, Johnno fronts up. Sorry to see big man leave, good luck in chosen future role. Amazing role model that needs to be in rugby."